Then ... When Matthew spills coffee on his shirt he takes it to his favorite Chinese laundry. 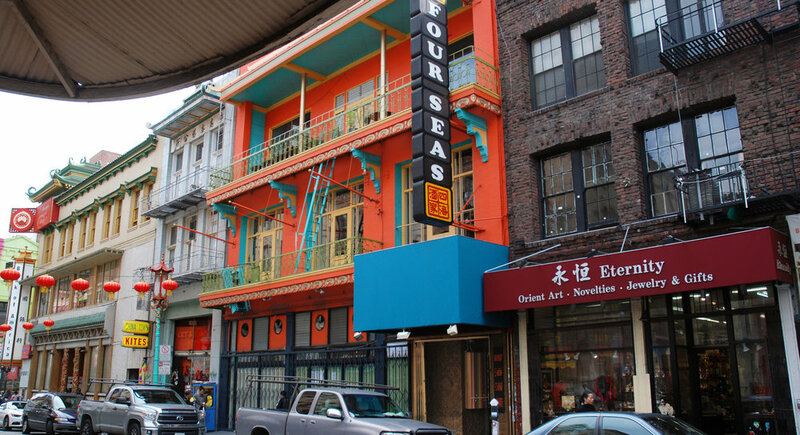 We see him here passing the Four Seas restaurant in Chinatown. ... and Now, the same entrance today, at 731 Grant Avenue (map), has retained the wall decoration but the doors have been replaced. ... and Now, the Four Seas took over the restaurant from the original Hang Far Low in the early 1960s, serving the neighborhood for decades until it closed in 2014. 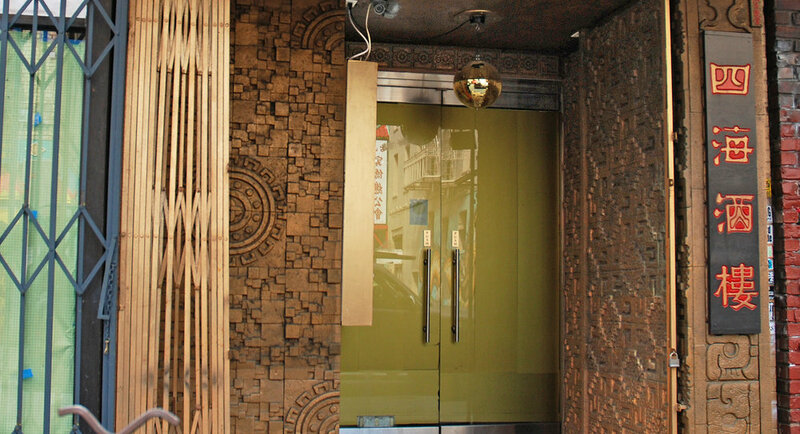 It recently reopened as Mr. Jiu's who moved the entrance to the rear of the building at 28 Waverly Place. The recent photo below shows the prominent Four Seas sign is still there on Grant, above the front entrance. Then ... He continues down Grant, here crossing Sacramento Street. ... and Now, the same junction today. Then ... But as he enters the laundry it is clear from the Victorian houses reflected in the side window that this place is not in Chinatown. 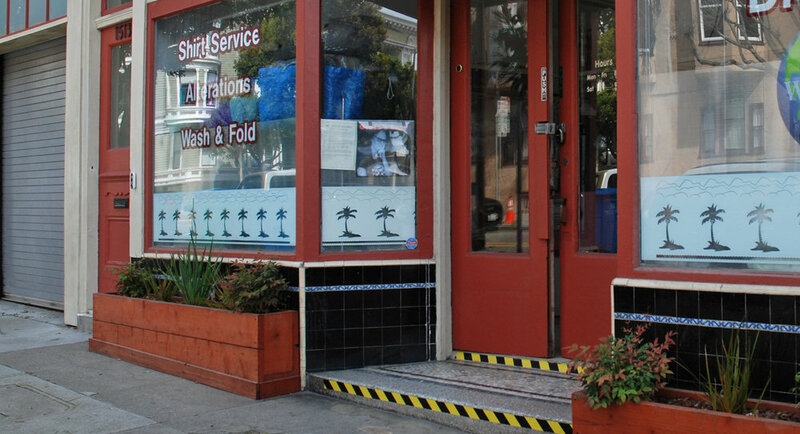 ... and Now, in fact, it's miles away in the Haight district, at 1515 Waller Street (map). It was called Russ Cleaners back then and it's still Russ Cleaners today. But at least it's Chinese owned. Then ... The owner, thinking Matthew is a doctor, beckons him over to tell him he's very concerned - his wife "she different", "not my wife". 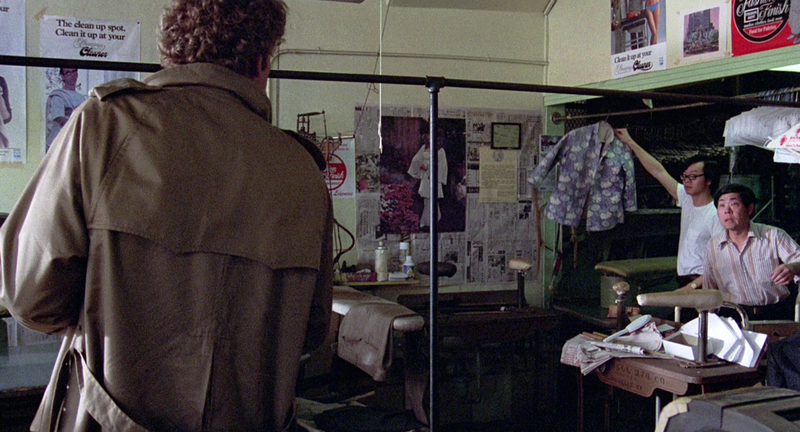 ... and Now, on a recent visit, based on the many racks filling the space, CitySleuth concludes the locals launder their shirts more often than they used to. Then ... When he leaves, a wider view of the laundry reveals more details that enabled CitySleuth to find this place. Not for the first time the audience is left puzzling over what is being disposed of in the garbage truck. ... and Now, the same view of 1515 Waller Street today. 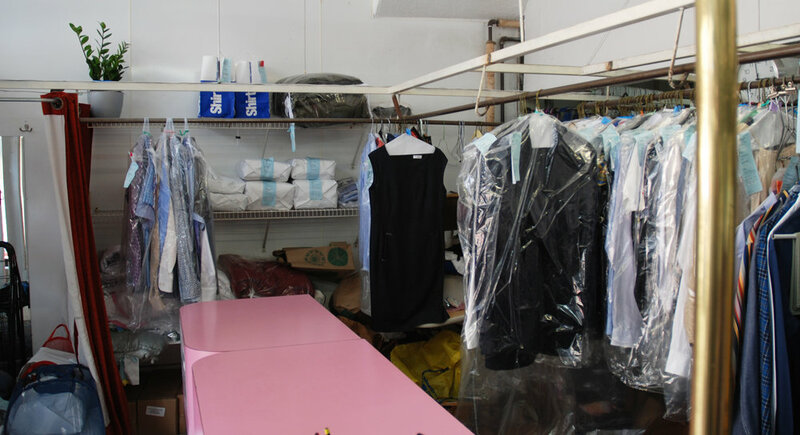 Russ Cleaners took over from Waller-Clayton Street Cleaning and Dyeing works in the 1950s and has been in business continuously under this name since then.